In today's note, we'll talk about portability or mobility. There are many reason why you might want a portable chicken coop. Chickens can quickly scour a small area of all grass and other foods very quickly - so they need to be moved often to have fresh food to scratch at. You can quickly and easily fertilize different areas of your yard (chickens are well-known to be great organic fertilizer producers and so a 'chicken tractor' can help with the gardening where once the chickens have finished preparing and fertilizing a garden bed or other area they then get moved onto another section to get to work on. 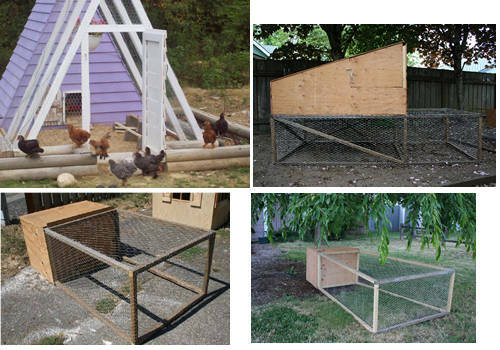 Whether you are making a traditional A frame coop or rectangle single or two story chicken house and run, one of the easiest ways to make a coop portable is to use 2 x 2, or 1 x 2, framing lumber, instead of larger 2 x 4 lumber. This makes your framing light, but sturdy enough to handle your flock. 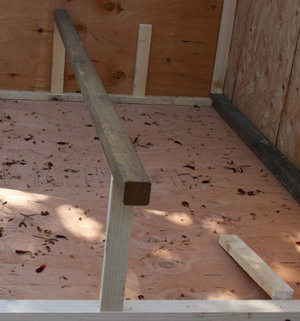 To help make your chicken tractor more moveable you could add wheels to the base or even place a piece of pvc pipe underneath the frame when you want to move it which should roll with the coop as pull it along. So... easily movable, by hand, with 1 or 2 people is going to be easiest for you in the long run.